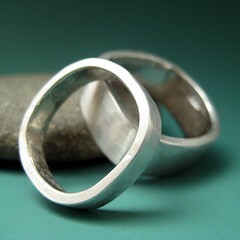 I just finished my custom order for a set of sterling square hammered wedding bands. I will pack them up in a moment and ship tomorrow. If you would like your own set of sterling wedding bands, you can visit my etsy store. It really nice wedding ring!